Santa Cruz Skateboards was founded in 1973 by Rick Novak, Doug Haut and Jay Shuirman in Santa Cruz, CA. 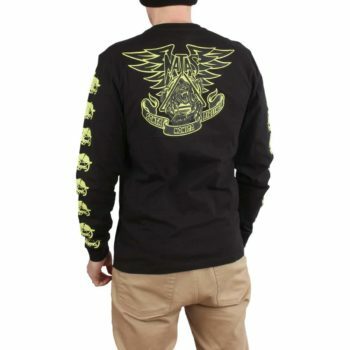 The brand has a rich history of collaborating with artists and is known for some of the most iconic imagery in skateboarding over the last 4 decades. Examples include, the Screaming Hand and Slasher graphics, created by the legendary artist Jim Phillips, and the “Classic Dot” logo. Over the years, they have sponsored some big names from skateboarding history such as Natas Kaupas, who had a run of iconic board graphics, that have now developed a cult following with collectors paying up to $3000 for rare boards, like the “Natas Kitten” and “Natas Panther”. 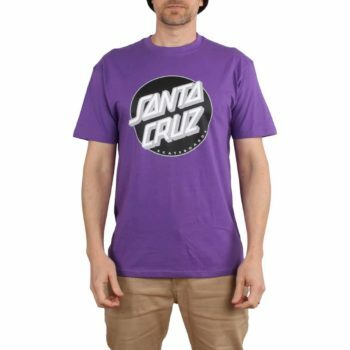 Still producing skateboards, clothing and accessories to this day, Santa Cruz is a classic Californian brand with a timeless brand aesthetic that continue to be relevant in skate and surf culture. 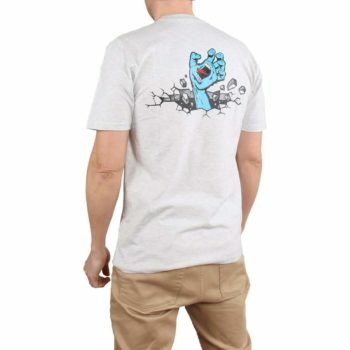 The Santa Cruz Hand Wall Tee is a comfy fitting short-sleeved t-shirt, featuring a Hand Wall iteration print of the classic Screaming Hand graphic on the back and a Santa Cruz branding print on the upper left chest. 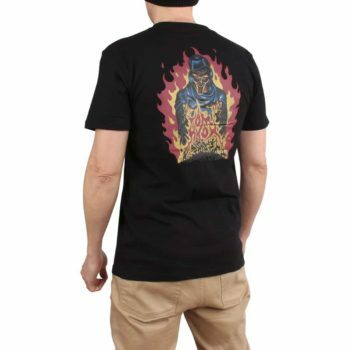 The Santa Cruz Knox Firepit tee is a comfy fitting short-sleeved t-shirt, featuring a Knox Firepit graphic print on the back and a Santa Cruz branding print on the upper left chest. 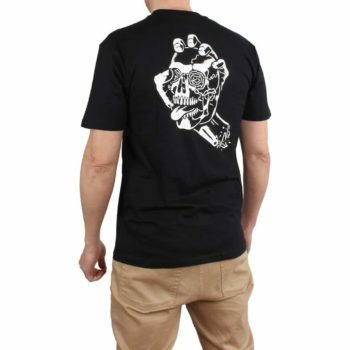 The Santa Cruz Screaming Skull tee is a comfy fitting short-sleeved t-shirt, featuring a Screaming Skull iteration print of classic Screaming Hand graphic on the back and a Santa Cruz branding print on the upper left chest. 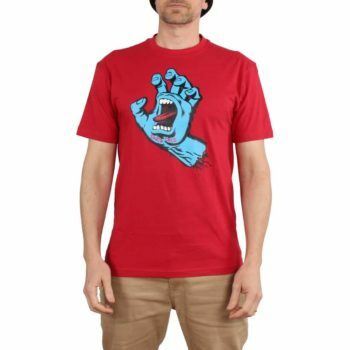 The Santa Cruz Screaming Hand tee is a comfy fitting shirt-sleeved t-shirt, featuring a classic Santa Cruz Screaming Hand graphic printed on the centre chest. 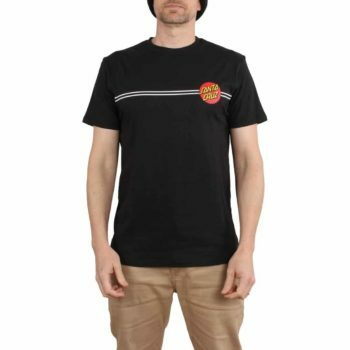 The Santa Cruz Classic Dot tee is a comfy fitting short-sleeved t-shirt, featuring a Santa Cruz Classic Dot graphic print on the front chest. 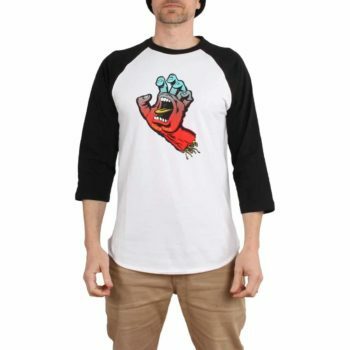 The Santa Cruz Cut and Sew Fade Hand Baseball tee is a comfy fitting 3/4 sleeved t-shirt, featuring a 2-tone iteration of the classic Screaming Hand graphic print on the front chest and a 2-tone Santa Cruz branding print on the upper back middle. The Santa Cruz OG Classic Dot tee is a comfy fitting short-sleeved t-shirt, featuring OG Classic Dot graphic prints on the chest and a larger print on the back. 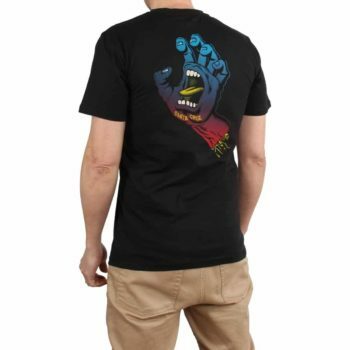 The Santa Cruz Fade Hand tee is a comfy fitting short-sleeved t-shirt, featuring a 2-tone iteration of the classic Screaming Hand graphic print on the back and a 2-tone Santa Cruz branding bring on the upper left chest. 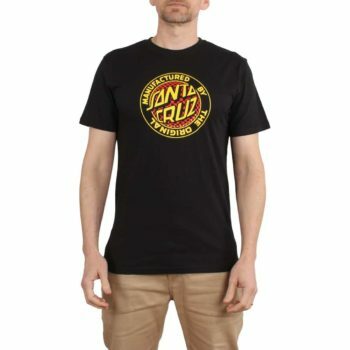 The Santa Cruz Fisheye MFG tee is a comfy fitting short-sleeved t-shirt, featuring a Santa Cruz Fisheye MFG screen print on the centre chest. 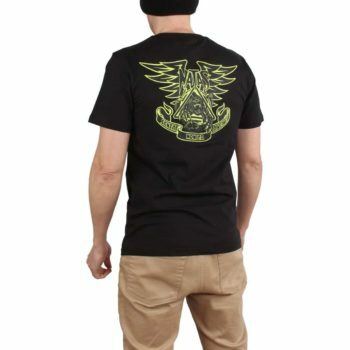 The Santa Cruz Natas Panther tee is a comfy fitting short-sleeved t-shirt, featuring a Natas Panther print on the upper left chest and a larger print on the back. Glow in the dark screen prints. 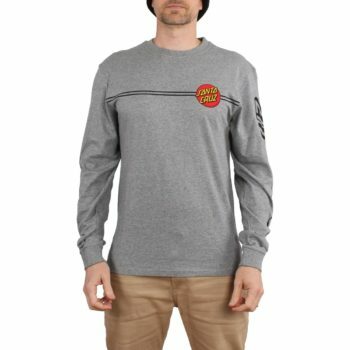 The Santa Cruz OG Classic Dot tee is a comfy fitting long -sleeved t-shirt, featuring Santa Cruz OG Classic Dot graphic print on the chest, down the sleeves and a larger print on the back. 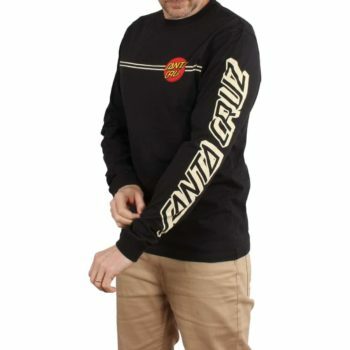 The Santa Cruz Natas Panther tee is a comfy fitting long-sleeved t-shirt, featuring Natas Panther prints on the upper left chest, down the sleeves and a larger print on the back. 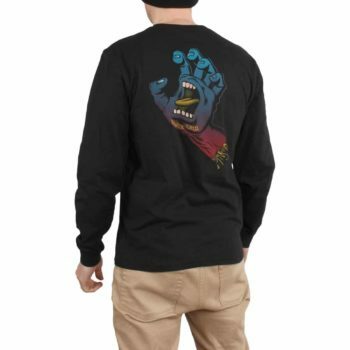 The Santa Cruz Fade hand tee is a long-sleeved t-shirt featuring a 2-tone colour iteration of the classic screaming hand graphic print on the back and a 2-tone Santa Cruz print on the upper left chest. 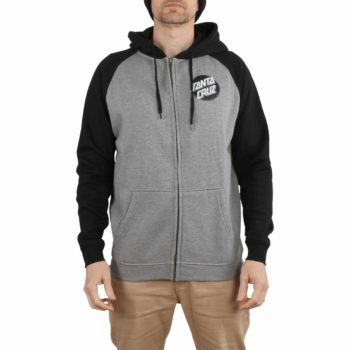 The Santa Cruz Other Dot hoodie is a comfy fitting zip-through sweater, featuring a Santa Cuz other dot print on the upper left chest and a larger print on the back.